While Inn Consulting Partners has gone through several name iterations in its 34 years of serving the Innkeeping community, a constant theme has been its efforts to provide quality, ethical service to all. A primary function of Inn Partners is to bring together buyers and sellers in successful transfers. Another constant has been the roles of longtime partners, Bill Oates and his spouse Heide Bredfeldt. Bill is the numbers guy, while Heide, a trained psychologist, focuses on the personal side of Innkeeping. The success of Inn Partners is in many ways tied to the fusion of Bill’s business and financial acumen with Heide's intimate understanding of the human component. We have been fortunate to add three associates to the staff. Tim Piper has joined us after 11 years as a partner of a Select Registry Bed and Breakfast in Vermont and a lifetime of hospitality management. He is the current president of the Vermont Inn and Bed & Breakfast Association (VIBBA). Inn Partners has been further enhanced with the addition of two vibrant millennials, Jojo Barrale and Eben Viens. They bring a knowledge of social networking and other contemporary technical details unknown to the other generation. Heide and Bill are emeritus members of Select Registry: Distinguished Inns of North America and members of the Professional Association of Innkeepers International (PAII). We are active non-members of everything else, devoting our time and loyalty to present and future Innkeepers. Inn Partners has consulted in the sale of over 300 Bed and Breakfasts and Inns in the United States (and two in Europe!). Over 150 of these properties have been Select Registry properties. Our ultimate goal is to facilitate successful transfers for both buyers and sellers. Believing knowledge is critical, Inn Partners offers regular Seminars for Aspiring Innkeepers. 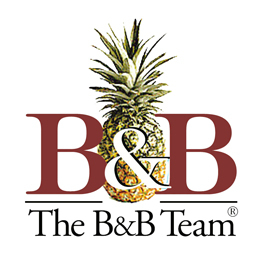 Bed & Breakfast for Sale was founded more than 20 years ago by industry leaders, educators and seasoned hospitality consultants with a clear understanding that marketing bed and breakfasts and other small lodging properties for sale requires unique focus. With thousands of previous and current listings and hundreds of sales, Bed & Breakfast for Sale remains the most effective, user friendly Internet portal for connecting buyers and sellers of bed and breakfasts, historic inns, boutique hotels, guest houses and other small lodging properties. Whether you are an aspiring innkeeper looking to purchase a property that matches your lifestyle and investment goals, an inn owner ready to explore life beyond innkeeping or a real estate professional tasked with selling a client property, Bed & Breakfast for Sale offers buyers and sellers an array of resources designed to educate and facilitate the sales process.